Several of these songs, by all three composers, I learnt through a couple of LPs with Irmgard Seefried in the mid and late 1960s. Her readings are still etched into my memory thanks to her deep involvement and expressive phrasing. A less positive feature in these late recordings was the deterioration of the voice compared to what she did a decade earlier. Especially on the later LP she was sorely strained as soon as singing above the stave was required. I did not at that time acquire any of Schwarzkopf’s Lieder records – my financial situation didn’t allow me to buy too many duplicates. Later I caught up and even though I never actually owned any of the three LPs transferred to this double CD I heard them from time to time. Gradually it dawned on me that Schwarzkopf and Seefried were probably the two foremost Lieder sopranos of the post-war era, only occasionally being challenged by, say, Elly Ameling. 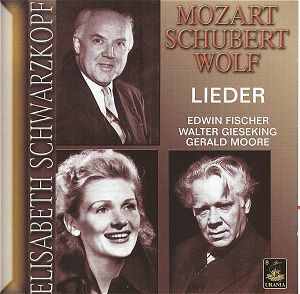 Coming back now to these three sets of recordings, originally released by European Columbia, I have to revise my earlier verdict slightly; Elisabeth Schwarzkopf is the more perfect singer who never sacrifices beauty of tone whereas Irmgard Seefried at her best may peer even deeper but at the expense of beauty. Both ladies regularly appeared and recorded with distinguished accompanists – in Seefried’s case Erik Werba, in Schwarzkopf’s Gerald Moore and later Geoffrey Parsons – but I believe that the three Schwarzkopf LPs under scrutiny outdo practically everything else she did in this respect. Collaborating in the Mozart and Schubert songs with two pianists not normally associated with accompaniment work undoubtedly brought a freshness and openness to the readings and a partnership on equal terms. It is perhaps most palpable in the Schubert songs, where one has the duo feeling, the two musicians responding sensitively to each other as a violinist and pianist would do in a Brahms sonata. Ganymed (CD1 tr. 15) is possibly the most obvious example but listen also to Die junge Nonne (CD2 tr. 2) or for that matter any other song here. Gieseking is a superb partner, listening and finding the nuances, but Mozart’s songs are still more of the “singer-with-accompaniment” kind. Ridente la calma (CD1 tr.1) is a splendid example of refined piano playing and of his finding the nuance juste for every phrase. Interestingly these old mono recordings catch the piano tone more realistically than many a later stereo recording. This might be the result of the drier sound that doesn’t muddle the sound-picture. To avoid any mistakes I am not going to say that Gerald Moore is in any way inferior to his two colleagues. On these three records Ms Schwarzkopf chose to be inspired by three of the finest pianists in the world and while Gieseking and Fischer could probably add fresh insights in the Mozart and Schubert songs, nobody knew Hugo Wolf’s very special tonal language better than Gerald Moore. At the same time Schwarzkopf might have one or two competitors in Mozart and Schubert but none in Wolf. And these two great artists in collaboration make us, at least temporarily, realize that Hugo Wolf should be mentioned in the same breath as Schubert as the greatest German language song composer. Pick any song in this programme: the three Mignon Lieder (CD2 tr. 7-9) so different and still so unified; the fourth Mignon Kennst du das Land, possibly the greatest of them all, the fastidious Ganymed and Anakreons Grab (CD2 tr. 11-13) and the last song Epiphanias CD2 tr. 20), all of them with that duo feeling, the piano part independent and still inseparable from the vocal part. I have concentrated on the pianists and written very little about the singing. Suffice to say that all three records catch Schwarzkopf at the height of her powers. The voice is creamy, beautiful, expressive and dramatic and she makes every syllable tell without over-emphasis. Someone who is starting a collection of Lieder recordings could do much worse than beginning here. This person must get hold of the texts somewhere or, better still, the sheet music which is possible to track down in several collections at reasonable prices. The transfers are good, though I have not been in a position to compare with other issues. What might be slightly disturbing is a low-frequency noise that disappears between the songs. I heard it principally when listening through headphones and it might be inherent in the original tapes but possibly it is surface noise from LP pressings that hasn’t been filtered. It is noticeable but doesn’t spoil the listening pleasure. Documentation is limited to a tracklist, the names of the pianists and the years of recording.